Summer colds are no fun. But usually, they’re no big deal. All three of our kids, ages 8, 5 and 23 months, had a terrible cough. None of them had a characteristic “whoop,” that the symptoms of whooping cough describe, but something about it was itching at the corners of my mind for a day. The next morning, as soon as my eyes opened, I thought: my kids have whooping cough. I was on the computer figuring out symptoms before anyone else in the household was up – or at least, up to stay. My toddler had, of course, been up what felt like dozens of times that night. It’s hard for me even to know where to start with this story, which will unfold over the course of three posts. *Edit: Quite a number in the KS community have mentioned that my original title, “When You Play the Vaccine Odds and Lose,” was the most inaccurate part of this piece. Here’s how one comment encapsulated it perfectly: “We are weighing the risks of vaccination with the risks of the illnesses. Even if we contract the illness we have not ‘lost.’ We do not regret our choice. It is a gamble either way.” Thanks to all who have commented (truly, read the comments on this post – so many heartfelt stories that deserve to be shared). For a while, I didn’t want to change the title because I thought it still had a lot of worth. But now that I’ve met too many people with actual vaccine injuries that impact their lives every day, I know the truth: THEY are the ones who truly lost the vaccine odds. Getting whooping cough and having no lasting effects from it is actually a win. When we were in the throes of whooping cough with all three, I was unable to share on social media for weeks because it was too raw, too real (and you all know I’m pretty darn open with my faults and being “real” around here!). Now, as we’re nearly finished with the effects of whooping cough, I’m looking back at the notes I jotted down when it all began. It already feels like a distant memory. Was it really that bad? I’m glad I wrote quite a bit while everything was fresh, because it’s a different story from the foxholes than it would have been if I was sharing from my current vantage point. How Bad is Whooping Cough? …you know it’s not just a cold. Experiencing whooping cough was bad enough that I felt embarrassed to share not only on social media, but with friends in real life. It took a while for things to feel less raw, but even now, my mouth is dry and hands shaking as I put the story together in print. We felt like it was our fault that our children, and in particular our 23-month old John, had to deal with the awful coughing and not being able to breathe. It’s gut-wrenching to watch. It’s equally gut-wrenching to question our decisions. I really can’t talk about contracting whooping cough without sharing our vaccine background as a family. When my oldest, now eight years old, was born, I did what the doctors told me, more or less. I hated the thought of formula and cried when I was told he wasn’t gaining weight well enough, and I had to supplement. But on vaccines, we followed orders. So son number one, Paul, was fully vaccinated until it came time for his kindergarten boosters, and then we entered the wonderful world of “the waiver.” He did not get any of his boosters. The reason for that is the research I did with baby number two, Leah. She’s three years younger than Paul, and our lifestyle had changed a great deal in those three years that I spent as a mostly stay-at-home mom. When I was expecting Leah, I read The Vaccine Book by Dr. Robert Sears. It’s wonderful in that it breaks down each vaccine as a separate decision and shares research on the risks and benefits of the vaccine. As a result, Leah started her young life with far fewer shots than Paul. We opted out of about half and delayed some others. By this summer, she had received two of her recommended five pertussis vaccinations (the vaccination for whooping cough). Although we had planned to begin one or two vaccines last year at his 12-month checkup, and he was even taking Vaccishield (a review product) in preparation, he got his very first cold right before the appointment, so we backed out, shooting for the 15-month checkup. At that time, although he was mostly healthy in between, he contracted another cold, and instead of shots, he came home with a diagnosis of pneumonia (which we treated naturally, at home – more fighting pneumonia naturally here). Our much-loved pediatrician left her practice to be a stay-at-home mom, and at the time of the 18-month appointment, I just didn’t know where we wanted to go for care, so I chose to hold off. John had pneumonia again right around his half birthday anyway (Katie rolls her eyes in disgust). The bottom line was that by mid-summer, a month before John’s second birthday, and through a series of odd coincidences and conscious choices, our toddler was completely unvaccinated against pertussis (and everything else). Believe me, even though I already said we had to learn to feel a bit detached during the coughing spells or lose our minds, the guilt of feeling like we did this to our child (and children) was intense. Raw. Embarrassing. 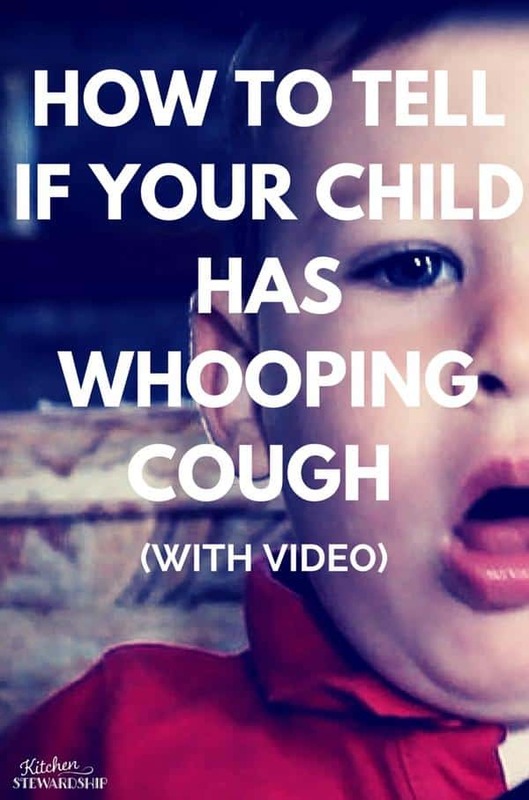 Whooping cough (pertussis) starts out like any other cold. You might notice a bad cough, but at first – when your child is quite contagious – you probably don’t even know what’s going on. Almost exactly two weeks later, just before we were considering taking Paul, the oldest, to the doctor’s to see what was up, the younger two started the cough. I’m not sure exactly how I started to wonder about whooping cough. Maybe John was just starting to develop the “whoop” sound, but he wasn’t very obvious yet. I just couldn’t stop thinking about our vaccination choices, how something was awry with this cough, and that it might be whooping cough, even though I couldn’t determine where in the world was the “whoop”. On that early morning research foray, my searches led me to a few basic sites that defined whooping cough, like this one, which began to confirm my suspicion but kept me looking. I read all the details at Mayo Clinic’s site, but it wasn’t until I found this whooping cough information and browsed around that site that I was 100% convinced. The WhoopingCough.net site is written by a family doctor from the UK who studied whooping cough in his community for 30 years. His goal with the site is help both parents and doctors diagnose whooping cough more accurately, because it is his opinion that whooping cough is severely underdiagnosed, and in my experience, I agree wholeheartedly. He has a few videos shared by parents, and the second I saw them – heard them – I knew we were dealing with a triple case of whooping cough. I can barely remember how I shared the news with my husband, but I can recall a visceral feeling of oppression. Of weight, literally sitting on my shoulders. I had no choice but to lift it up and move on, but it wasn’t an easy load to carry. That was two weeks in, and one of the facts I learned on my research expedition was that antibiotics are most effective in the first five days and really only help to keep the disease from being contagious. The disease itself more or less ends after three weeks (but may last up to six weeks). Since we were 14-15 days in, by the time antibiotics would kick in, John would likely not be contagious anymore anyway. We decided against pursuing a prescription, my one silver lining: two of my kids still have never been introduced to pharmaceutical antibiotics. One other fact I learned was that in Asia, whooping cough is called “The 100 Days Cough.” We were about to find out why. Only half of all whooping cough cases present with the “whoop” sound, which is one reason pertussis goes severely underdiagnosed. 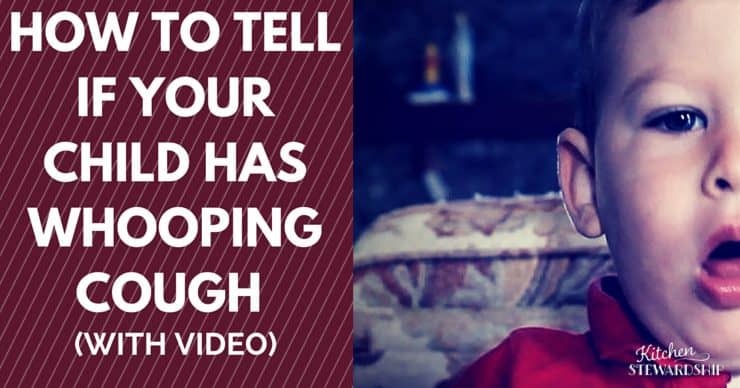 It’s recommended that if you suspect it at all, or if your child tends to go long spans of time without any coughing, and then has a huge coughing attack (a key symptom of whooping cough), you should try to get a video to show to your doctor. Chances are, the child wouldn’t end up coughing during the doctor’s visit and you’d get an inaccurate diagnosis. If you can’t see the video, click HERE to view it on YouTube. He clearly has the whoop, which started about 15-16 days in. The sound of the deep, chesty coughs reverberates through the walls at night. The rhythm isn’t hack, hack hack; it’s “Ah-tum, ah-tum, ah-tum,” almost two syllables, more like a sneeze cadence than a cough. The classic “whoop” is a fairly easy-to-recognize sign, but neither of our older kids exhibited it. They both did have coughing fits that made it hard for them to breathe, like too much “out” without enough “in” for their air, and also exhibited the classic whooping cough sign of going long periods with no coughing at all. It was during this time when I had the unfortunate experience of blueberry smoothie making a return appearance, after John had been enjoying our new review product, a Squooshi reusable food pouch, and wandered onto the carpet before I realized it. I was pretty adept at knowing when the upchuck was coming – did I mention yet that he vomited or at least spit up about a dozen times a day? I caught some but not all of the green/blueberry smoothie. This natural carpet spot cleaner post was one of the first times I alluded to the whole saga, and that wasn’t even written until some months later. And how long does it really last? Somewhere around 7 weeks (or 49 days). I wrote down that “50 days might as well be 100.” It feels long, and I couldn’t imagine how 50 more days was going to feel. While preparing for this post, I was still trying to tape the sound of John at night through the monitor to share online, because he still had the “whoop” sound. I checked the calendar, and it turns out that it was exactly a frightening 100 days from the start date when symptoms appeared. With three cases in the house, we saw plenty of whooping cough symptoms. If you really want to understand the disease, I can’t say enough about this doctor’s site, which has everything the rest of the Internet has on whooping cough plus a ton more information and experience. Not everyone will demonstrate all the symptoms, but whooping cough is almost always characterized by a long break between coughing spasms. By the way, did I mention I’m not a doctor, not a nurse, not anyone qualified to give medical advice of any kind? I’m just a mom who had three sick kids, read some stuff on the Internet, and felt compelled to share. Please, don’t take any of my advice with any more weight than you’d accept advice from a random neighbor. Reading a list of the symptoms, and even watching the video of my kids, neither of whom had a truly serious case of whooping cough, cannot do justice to the fact that it’s literally a new lifestyle, with as many emotional pressures and habit changes as the transition to say, a grain-free lifestyle doing it all at once. During our experience, when I had an extra brain cell available to think, I was often thinking about how I would eventually have to share the whole story with all of you, because I think it’s important to get beyond the text in a book describing a disease and into the life of a real family who experienced it. You have to be ready to deal with coughing-to-vomiting a dozen times a day. Not for one or two days, but for 2-4 weeks, potentially. Are you ready for 100 days of shortened or missed naps? You have to be willing to have your child cough so loudly and sound so scary that everyone in the room looks at you. Imagine yourself saying to someone you’re acquainted with: “My child has whooping cough.” Evaluate how that would make you feel. You have to be ready to keep your child out of school or daycare for 21 days – and siblings too? That includes church, library time, and any other fun family functions you might have planned in a given month, summer or winter. You have to be willing to stay away from all the babies in your life for a long time, 3-4 weeks at least, and probably all elderly people too. Consider an illness that lasts 7 weeks to three months. Can you sustain care that long for your child? You have to be prepared to deal with rude people who will judge you for not getting your baby/child vaccinated. You can’t love your sleep. You’ll likely wake up somewhere between once an hour and three times a night, or sometimes once every 5-20 minutes. Then again, you may have to go through the same list even if you do vaccinate…which is precisely the problem. The range of emotions as a parent can’t be underestimated – from being in agony watching your child suffer, to feeling guilty and second-guessing about the vaccine decision, to becoming detached during every coughing spasm, to acting more like a doctor or nurse than a mother or father, to fearing the spread of this disease to babies. I cannot tell you what it’s like to imagine your child as a walking death trap to a newborn child, and to attempt to walk backward through the two weeks when you didn’t know that it was whooping cough, trying to figure out if we could have infected anyone else. UPDATE: Here’s part two on being contagious with whooping cough and part three on the vaccination decision (and inaccurate statistics). I don’t know why anybody would choose to not vaccinate their children. Pertussis outbreaks tend to occur in areas with low vaccination rates. This story just reinforces my belief in medical science and vaccinations as the proper way to care for young humans. On the flip side my child spent several weeks in the hospital after my child severely reacted to a vaccine. He now has permanent brain damage. I’d rather manage whopping cough or any other vaccine (since their ability to prevent is often overstated) than the three years of therapy, specialist, and seizure management that my child will have to live with for the rest of his life, which btw we are told will be shorter than normal. Children who have been vaccinated also get whooping cough. Several of the recent “outbreaks” began with vaccinated children. There can be lifetime side effects to vaccinations. I know this comment was awhile ago, but I just wanted to share what I have learned while our youngest four children have whooping cough….we are about halfway through right now. A friend of mine who is a nurse (her eleven children have or just got over whooping cough) told me that the doc who prescribed antibiotics informed her that the outbreaks that have occured are from immunized children. The reason is that the vaccine was made much weaker because of the terrible side effects of the original vaccine! Also, as stated in this article, antibiotics only help with the symptoms if you go on them BEFORE you have the cough….otherwise it just keeps you from being contagious. We chose not to do antibiotics (we’ve not gone anywhere or seen anyone for weeks!) and we are very glad we made that decision as we have found out since, that if the body is allowed to go through this and fight it on it’s own you are almost guaranteed never to get it again. FYI, measles and rubella are two different illnesses. I believe that rubella is sometimes known as “German measles” but it is not the same as measles, and does not have the same risks of birth defects. Last year my daughter (8) & I got whooping cough from a friend (a nurse) who got the pertussis vaccine for her job. We immediately started using essential oils (Breathe by doTerra) & got over it in 2 weeks time. She had it for over 6 months & after taking 2 doses of different antibiotics finally got over it. I chose not to be vaccinated after being educated on the side effects of most vaccines themselves. Those who chose to be vaccinated do it out of fear of the diseases themselves & the promise of what the vaccine has to offer. Nothing more, Nothing less. It is very brave of you to write this and very helpful that you have written it! I commend you for it! The part about wondering if your child infected someone else who is more fragile is what seems like it would be the hardest in this situation. If this was during the school year when your children were older so they missed out on serious school work or if you were working out of the house so you needed to take 2+ months off work to care for your 3 children, who successively got sick, it would have been more disastrous. Many people would have lost at the very least their incomes for that time period, possibly they would have been fired. As it is, things kind of went pretty smoothly for you. Your children now have better immunity than they ever could have gotten from a vaccine! And it sounds like everyone has recovered well without infecting anyone else who may have had a horrible outcome. Praise God! I am a foster parent (recently adopted my 2 oldest, fostering the babies still) so I haven’t gotten to make these decisions for my kids and they are all fully vaccinated. I think there are many benefits to vaccines however sometimes there are some benefits to not vaccinating. Que Sera Sera. The future is not ours to see. I stopped reading your blog when you were writing about not getting antibiotics for group B strep. The mother of one of my former foster babies lost a baby to GBS years ago and I saw what it did to her. She went off the rails losing custody of her older children to her parents and went on to have a baby every year who CPS took. She eventually got her life back together to some degree however her children spent years out of her care with very disrupted childhoods and negative prenatal exposures and the surviving children bear the scars from this experience. While there is nothing wrong for you to decide things for your family, I do feel like it is somewhat irresponsible to suggest things that go against mainstream medical care for those who are not in situations as stable as yours. I strongly disagree with this statement. It is an individual’s (i.e. the reader’s) responsibility to carefully weigh their own situation and determine the right choice for their own family. Following mainstream medical advice has its own risks too…ask people whose children have died from tainted Tylenol or vaccine injury. Life is just risky. Parents should seek out information on both sides of the issue, know the pros and cons, weigh it with their own situations, and take responsibility for making their own decisions. Anyone who does something “just because so-and-so does” on either end of the spectrum is the one being irresponsible. A stable lifestyle? What does that have to do with anything? Mainstream medical advice used to be rubbing feces on open wounds too. As far as your story of the lady who lost a baby to GBS… you said yourself that the lady lost her older children due to “going off the rails” – doesn’t sound like CPS took her other kids because of her refusing the antibiotics- they took them because she was mentally unstable after the death of a child – which is understandable. Or is that not what you meant? Don’t feel completely terrible. 4 of my completely vaccinated siblings contracted whooping cough as well as my mom. I was slightly freaking that I (preggo) and my boys 1 and 3 were going to get it since we had been exposed to it by my family, but God spared us. We did take GSE as a preventative. I really don’t know if it helped, but it gave us a peace of mind that we were at least doing something. I personally would most likely get an antibiotic for pertussis. (none of my kiddos have ever had a prescription either) We always take GSE if there is a cough involved with any kind of sickness. Better safe than sorry IMO when it comes to pertussis. I hope that all comment leavers will be kind and not judgemental to you!! We decided to stop vaccinating after our first child, too (#1 is fully vaccinated through 18 months, #2 completely unvaccinated). I never even considered it, but the VACCINATED child could have had a case of whooping cough from the beginning of August through the end of September. He would wake up in the middle of the night coughing just like your daughter in the video, but that was “almost” the only time he would cough. And he experienced this after being around a sick cousin who was coughing constantly. Luckily, somehow, the unvaccinated child did not have the same issue. She got a cold for about two weeks, but no lasting cough. My mother is quite sure that I had a case of whooping cough when I was in high school and I was fully vaccinated as well. I had coughing fits for about 4 months and the doctor just diagnosed it as bronchitis — for 4 months (this was an isolated incident of coughing, no reoccurrence after)?! All that was to say that, in my opinion, you have no reason to feel guilty because vaccinations (as have already been proven through research) do not guarantee immunity from the disease. And if they did then there would be ABSOLUTELY NO reason to FEAR children (or adults) that are not vaccinated. Laura, if your daughter was only coughing at night, it could be asthma. At certain times of the year my kids start coughing like that almost only in the middle of the night. It’s because of their environmental allergies- like certain things blooming or molds growing at certain times of the year. Asthma can be hard to diagnose- I didn’t know I had asthma until I was over 30. First, you are brave to share this and I appreciate it, especially as someone who does not have children yet, but will someday sooner rather than later. A question: Was the 8 year old vaccinated against whooping cough? If so…my question would lead into…so, is there a booster for whooping cough? If there isn’t a booster…does the vaccine work if he got whooping cough anyway? That is my question with the pertussis outbreaks currently. I have read some research that indicates that this strain is a completely different strain than what is vaccinated against anyway…and if that is true, then vaccinations would not have helped. But I can’t find any proof-positive research that this is true. I also can’t find any proof-positive research that the vaccine works, because it appears that most kids catching it are vaccinated kids. So I feel confused about the whole thing, much like it sounds you guys were. If you are planning to answer some of these questions in a later post, then no worries! I’ll keep reading. Again, thanks for the real-life example. It is helpful to me. Yes there are boosters. I forget how often you are supposed to get them. Atlanta had a huge whooping cough outbreak around the end of last year. My SIL was pregnant at the time (Charles will be 1 on 12/10) and both her ob & her pediatrician told her that anyone that would have extended contact with the baby needed to be vaccinated, even if they had already been. If I understand correctly (and Katie mentioned it in her post) the biggest risk is to very young children that have not had the opportunity to be vaccinated yet and anyone with a weakened immune system (eldery HIV+, immunosupressed, etc). For me, and I don’t have kids, I had no issue with the vaccination becasue I couldn’t bear the thought that I could accidentally infect my nephew and possibly kill him. We certainly cannot protect kids (or ourselves) from everything out there – personally I believe in vaccination but I am not going to judge anyone who chooses not to vaccinate their kids as long as they have made an informed decision like Katie did. What bothers me is all the people who choose not to vaccinate because some celebrity tells you that vaccines cause autism without doing any research or even talking to their doctor. Also, I had a very good friend in college who got whooping cough and she had been vaccinated and gotten all her boosters so that is something else to consider. I know you will likely get some not gentle comments here, so I will try my best to be gentle and not involve myself in the great vaccine debate. A few things, though, have you read The Panic Virus by Mnookin? Or anything by Paul Offit? I also read Sears’s Vaccine Book but changed my mind about alternative vaccine schedules after reading the other two books. I also just completed a vaccine course by Paul Offit offered by coursera.org that I found extremely informative. I hope you’ve done research more than just online and from Sears’s book. I also as a nurse want to remind you that many of the diseases you’re choosing not to protect your children from are FAR worse than dealing with whooping cough. Many of those diseases can result in death. Imagine the guilt one would feel if your child contracted a preventable disease and died. Yes, I understand this is a flagrant statement, but I’ve witnessed children dying in the pediatric ICU and would never want a parent to experience that pain if he/she could prevent it. Please also consider the many people who cannot receive vaccines due to compromised immune systems who might contract a preventable disease from your family. Thank you for sharing your story and bringing attention to the risks of not vaccinating your children. We’re all the same. We love the idea of a vaccine (protection against illness, who wouldn’t love that? ), but we’re terrified by unforeseen reactions, some years in the future, of things that we don’t really understand that are promoted by people and companies that make money by promoting them. Vaccines clearly help the greater good, but nobody wants to be that 1 in 1,000,000 (or less) that has something go terribly wrong. I just wish there was more transparency and less profit motive. this is just like the “seat belt” debate. Yes, even a properly administered vaccine or seatbelt use can very occasionally harm or kill some one, but they save soo, SOOO many more every day. Do you even consider not buckling up your kid because they might be come the one who is injured? I doubt it. Sort of…except that the seatbelt will only potentially hurt the child if there’s an accident. A vaccine could hurt the child just because you chose to put something in his body. If the only information against vaccines that you have read is from the Dr. Sears book, it would seem that you have not done enough research to warrant any educated opinion on the subject. I have read four different anti-vaccine books (The Dr. Sears book, Vaccine Safety Manual, What Your Dr May Not Tell You About Children’s Vaccinations, and How to Raise a Healthy Child in Spite of Your Dr). And have done hours of research online both for and against the issue. A vast majority of people that vaccinate or promote vaccinations do no research on either side of the argument and even fewer read the arguments against vaccines from RELIABLE sources. While most of those parents who choose NOT to vaccinate are the ones reading the literature and studies on vaccines and their effects. A coincidence? Hardly. Therefore, the only people who have any right to speak out on the issue are those that have truly done their research (which is mostly those choosing not to vaccinate) instead of just listening to the mainstream advertisements and propaganda. It’s not fair to say that most of the people who do their research choose not to vaccinate. I don’t see any reason to believe that statement. Vaccines are extremely effective and extremely safe. They are not untested – we’ve been using them for decades. You may choose not to vaccinate based on your research, but that is not the conclusion that everyone, or even most people, necessarily come to. Who says the vaccines are safe? The FDA, CDC? They can’t be trusted. All of them are bought and aren’t looking out for the best interest of your child. Yeah they have been tested. Where is the data showing adverse reactions in the test? The public only received information on the “tests” they wanted us to know and believe me they sure didn’t want the public to know that they knew there was a 1 in such in such chance that death or something else bad could happen upon vaccination. Who wants to play Russian roulette with there child knowing that? When you people that are pro vaccine have somebody in your family that has a bad reaction then I guess you can chalk it up as a lucky draw of the cards since your willing to take the risk. No disease is preventable. And as a mom I sure want to make a good decision…we’ll never know for sure what is the right decision, but we want to do the best we can! i am sorry, but i take exception when people play the “what if someone else gets sick because you are so irresponsible to have not vaccinated your child? ?” card. it’s a bunch of baloney, sorry but i can’t mince words here! the MAJORITY of the infected populations in pertussis outbreaks are FULLY vaccinated! what does that say ? just because you are vaccinated does not mean that you cannot spread the disease. This is a misconception that HAS to be stopped!! i am sorry i don’t mean to sounds irate, but it really needs to be addressed. people are free to choose vacs, but they need to be fully aware that they are still JUST AS LIKELY to SPREAD THE DISEASE in cases of pertussis, especially, which is an outdated and ineffective vaccine. stop fear/guilt mongering when do not have your facts straight. This was not a very kind reply. Karen was very informative and kind in what she wrote. The link you linked to was not a study. It was just a letter someone wrote. If 90% of people are vaccinated and half of the pertussis cases are in people who have been vaccinated, that is still showing protection from the vaccine albeit only partial. If there was no protection as you claim, 90% of the people with the disease would have been vaccinated. The 50% number doesn’t support your yelling that the vaccinated are just as likely to spread the disease. You do realize that Offitt is an extremely biased information source, right? He collects royalties on about every fully vaccinated kid, as he is one of the patent holders for one of the infant vaccines. He is totally a shill for the pharma companies. There is a million dollar challenge out there for him to take even 10% of what he says would be a safe number of vaccines…but he hasn’t taken it up anytime in the over a year since it was made. I went through this with my family last January/February. I know you’re pain!!! I am a die hard WAPer, eating and promoting healthy foods for 10+ years. Ours came right at Christmas last year. My oldest was in ER on Christmas night! His coughing was so bad and he was getting so little air. He needed the steroid he was given. I didn’t go for the antibiotics. Read that it doesn’t help much and wanted immunity, which I heard they can disrupt. Anyway, he had it the worst by far. He’s a teenager and also consuming the worst diet in our house. My kids were not vaccinated, but I was and I got it pretty bad as well. Didn’t you move recently? I’m convinced our recent move across the country took a toll on us when our guard (raw milk products and good meat) was down for 4 mos just prior to this. We caught every bug last winter that came our way. I’ve never seen any winter like last winter. Wow! We survived. I’m hoping and praying our systems have adjusted, but I’ve been turning 50 lbs of whole chickens into chicken broth this week. We did tons of vitamin C and D3. Stocking up on that, too. I’m gearing up just in case. I’m sure you feeling huge relief right now. It’s still fresh in my mind and heart. LONG is absolutely the right word! God bless you and your family!!! If I believed that vaccines were safe and effective, I would feel guilty about not administering them. But I DON’T believe that they are either of those things, and far prefer to keep a close eye on my kids’ health and aggressively pursue treatment if they contract a serious illness. I can’t tell you how much I appreciate your sharing this. I’m not a black and white thinker–I see a lot of gray. I’ve gone back and forth and since I read more crunchy blogs (like you) I encounter so many “this is why I don’t vaccinate” stories. I appreciate a “this might happen if you don’t.” Since I’m a gray thinker, I’m a selective/delayed vaccinator also so I get it from both sides. Some people treat it as if I’m abusing my child by him any vaccinations or and some people treat it as I’m abusing my child by not giving him all recommended vaccinations. I appreciate very much just hearing your perspective. I could absolutely understand your not wanting to share this story, but it is so helpful for anyone who really wants to gather all relevant information when making these decisions. Thanks again. Yes!! Thank you, Katie! I appreciate your willingness to be transparent and honest – It’s a gift to those of us trying to make a decision on this topic. I am wondering if you now wish your children had been immunized for whopping cough? Hugs to you mama for sharing your families experience. We select vax and were having trouble deciding on dTap for our newborn. I think we will be getting it after all. We are coming out of a case of croup going on 3 weeks and that’s bad enough. The worst is keeping DS, 19 months (select and delayed vax, fully dTapd) out of play groups, play lands, story times, etc. can’t wait for the next two installments. You are very brave to write this & I am glad. There are risks with both vaccinating and going without. Life itself is risky. I fully vaccinate my kids according to the pediatrician’s schedule. Yet still, I would fight for any parent’s right to not vaccinate. It’s terribly unfortunate that any negative outcome in a non-vac family would likely be blamed on the choice to not vaccinate, while any side effect of vaccination is seen as a rare, unfortunate occurrence. It’s like homebirth. While I do vaccinate, I chose to have a homebirth, and if anything had gone wrong, you bet everyone would be pointing the finger at my choice to have the baby at home. Yet if something happened at the hospital (equally as likely/rare, statistically) there would be sympathy, not judgment. I wish we could remove the stigma from these controversial decisions, and allow parents to honestly weigh the risks on both sides and choose. Thank you for adding some useful, practical, real life information to the discussion. I’m not so sure about the home birth comparison…as Katie mentions in other articles, statistics on vaccines can be confusing, but with home birth people forget an extremely important piece of information when saying statistically fewer complications arise. The only women who are supposed to attempt a home birth are healthy mothers with uncomplicated pregnancies. Anyone with likely complications must go to a hospital, therefore vastly driving up the number of “problems” that arise in hospital births. It would only be statistically relevant if hospital complications were only considered for healthy mothers with uncomplicated pregnancies, therefore covering the same “demographic”, if you will, as those who try home birthing. I’m sorry, I don’t mean to sound judgmental, and I would be the first to console any woman who lost a child in home birth…it’s just that one of my brothers wouldn’t be here if my mom had tried it and I don’t think it’s ever worth that chance. She had a totally normal pregnancy, and she’d delivered six kids before him. However, his heart rate plummeted so unexpectedly that they had to throw a planned C section in preparation out of the OR to get him out in time. Even if the odds of this happening were only one in a million (they’re not), that feels like a lot if you’re the one. I know some may compare that to vaccines too, but it isn’t the same. Generally what you risk in having a hospital birth for your child’s safety is possibly receiving interventions you didn’t want (which is mom’s problem, not baby’s) or maybe a complication you’d hoped to avoid (e.g. some claim tears are more likely in the hospital, though this isn’t verified). You’re not typically risking the baby’s life in choosing the hospital, so I think it’s much more clear cut than vaccines (possible death at home compared to possible unwanted interventions at the hospital, possible serious problems without vaccines compared to possible serious problems with vaccines). Thank you for sharing your story. I know it wasn’t easy for you. Those of us who agonize over whether to bow to peer pressure without question and vaccinate our children fully or to not vaccinate at all and risk the judgements of even family, or somewhere in between…we know these are not easy decisions. Research, prayer, and we feel guilty if we “get it wrong”. Especially if we chose the natural route and not the vaccines. All we can do is what we think best for our children and not beat ourselves up. When will we as a society to learn to help and comfort, not chastise and judge? God bless. katie- thank you for sharing your story. i can relate, in many ways. but first i have to say i don’t agree with your title “playing the vaccine odds and “losing”‘ because the pertussis vaccine is one of the worst- in terms of unreliable and most toxic. most outbreaks of pertussis, meaning the majority of those affected, are FULLY vaccinated. so don’t think you played the odds and lost- you could have just as easily ended up in the same scenario had your entire family and every single person you ever come into contact with been fully vaccinated. this is a discussion we ALL need to be having about vaccines. it’s not just about are they safe, the additives, etc. we really need to be asking our doctors, are they EFFECTIVE ? how much ? how has this vaccine kept up with the disease over the last 5, 10, 20 years ? or has it at all ? this article on pertussis highlights the reason many european countries have abandoned the vaccine. it just doesn’t work very well, very often. the really bad part is, people who are fully vaccinated need to be aware that they can very well still carry and contract the disease, especially to newborns. it is a personal choice if you want to go ahead and get the vaccine, knowing full well it may not be effective and you may have to get a booster every other year (and still not be effective); but people NEED to know that, and not have a false sense of security from having the vaccine. i just wanted to say that i have three children, none of whom are vaccinated. it has been a hard and well researched choice. this january, i was due with my 3rd baby in march, and my five year old daughter had a nasty, nagging cough. we had to take her to the ER on the weekend because she was coughing so hard, so often, she was vomitting, and frankly could barely function she was coughing so much. the ER doc was just sure it was pertussis, since she immediately noticed she was unvaccinated, and tried to chastise me for putting her and oh yes my unborn child at risk. of course the culture came back negative for pertussis; she just had a bad cold and it affected her lungs like she had asthma (which she does not) for the duration of the cold. antibiotics, which i knew she needed and has only had once, helped within 24 hours. fast forward to march. baby #3 born at home, and doing great. still blustery winter outside, and i had this strange conviction he would somehow catch a bad cold and end up in the hospital. weird because i am not a worry wart type, especially about sickness. but i pulled the babymoon card and would not let hardly anyone visit- absolutely no kids. nevertheless, grandma and grandpa, unbeknownst to them, passed on a very bad RSV bug to my older kids and of course then to the baby. my worst nightmare was realize when, less than two weeks old, i took him to the hospital because i just knew he had caught it and he needed a little help. he was hospitalized for over a week. luckily, thank God, i took him there right on time that they caught the pneumonia before it got very bad at all, and the IV antibiotics really helped. he hardly actually lost any weight (the doctors said i must make cream and not milk- thanks to all the nourshing fats i eat!) and did remarkably well. but it was a challenging time for my husband and i, we did some real soul searching, and of course had several doctors ask us about the vaccines. but even though i opened up my heart to God, and questioned everything i believed in and the decisions i had made, i came out on the other side just as sure as ever that we had made the right choice to not vaccinate. it’s a choice every parent has to make, and all i am saying is that i will stand by my choice and not let anything scare me away from it. I wish there was a “like” button on here. Thanks for sharing. I am getting so much encouragement from many in these comments. I haven’t read all the comments, so this is in response to your post itself. There is potential for so much mommy guilt – Please don’t allow yourself to experience that negative emotion. As you said, even if you had vaccinated, whooping cough can happen. As a CBE, I worked with new parents who did all the vaccinations and still had a small baby with whooping cough. There are no guarantees in this world. It is what it is. I think putting a label on it like WHOOPING COUGH (and having that societal pressure/stigma) makes it worse for you mentally. I cannot imagine the nightmare it was for you, but I have witnessed similar nightmares in the form of viral pink-eyes, unending painful eczema. This is only similar in that your children had a disease, you nurtured them back to health through your love and attention, and now (almost) all is right with the world. Congratulate yourself rather than second-guess yourself… therein lies the silver lining here. Thank you for sharing, though I feel the title is misleading. Many fully vaccinated people contract pertussis, so ….. I would like to know if you did any healing protocols during the time of illness for the pertussis? I come from a family of 6 sibblings and none of us were vaccinated with the exception of me getting one polio shot in 1961 after my parents argued about it. All of us had 1 polio vaccine between the years of 1955-1963 when the vaccines were infected with a monkey Virus SV-40, a cancer virus that is carried in the blood and passed down from generation to generation. It is the cause of the epidemic cancer rates and especially lung cancer in people who have never smoked. I just recently found this out by reading a book from amazon called Dr. Mary’s Monkey. USA Today posted an article about this revealing information this past summer and I was sickened. We have always been told that cancer is not a virus and has no vaccine, so why the Gardisil shot for cervical cancer prevention? I chose not to vaccinate my two kids who are now adults with kids of their own. I have an autoimmune disease that this polio virus is also the cause of and my daughter has autoimmune issues. I watch 2 of my 7 grandchildren and all we use for them is homeopathic remedies. I became acquainted with Joette Calabrese when I was attending Integrative Nutrition and her CD’s are my lifeline to no more meds. I noticed in your post that you said your kids had none of the conventional antibiotics from pharmaceuitcal companies but did you know that over 85% of the antibiotics produced in this country are sold to farmers to put directly into the feed of their animals? Whenever your children eat meat at school, a fast food restaurant or even from the grocery store they are ingesting antibiotics. And, going gluten free is great but is not totally healing for the gut if you are not also looking for Non GMO grain sources. GMO soy, corn, canola, sugar beets, alfalfa and cotton contain roundup. Corn is labeled by the EPA as a pesticide, not a food! Buying gluten free products from food manufacturers that have no problem slapping a gluten free label on their products but laying out millions to prevent you from knowing that their products contain GMO’s are doing you and your family a huge disservice. In my opinion GMO’s are the issue we need to be getting behind. Over 70 million has been spent to fight our right to know. GMO’s are destroying our guts, our immune systems and our health. And, now that the super bugs and super weeds have outsmarted the roundup, they will be using even stronger herbicides and pesticides like Dicamba and 2,4D, the main ingredient in Agent Orange. This is the reason for our food allergies and gut issues, these GMO’s are exploding in our stomachs and sending foods into our blood that our bodies are fighting. Thanks for sharing your experience, this is what parents need to know when making decisions about vaccines. The title of the piece makes me really uncomfortable. I don’t know of many parents that choose not to vaccinate and just hope their kids never get an illness. IME, most parents that choose not to vaccinate trust the inherent ability of a healthy body to cope with illness, and trust that illness is a part of life and normal development. So to me, becoming infected with a (so-called) VPD doesn’t mean I have lost anything, rather that the immune system is overwhelmed and I can make changes to support it. The second point of contention being with your need-to-know list if you don’t vaccinate. EVERYONE needs to know this information, regardless of vaccination status. As many others have pointed out, the effectiveness of the vaccine is low. Your underlying tone is that getting a vaccine frees one from these parental responsibilities. You went as far as to point out that pertussis is under diagnosed, I would assume in a large part because docs don’t bother to consider it if a person says they are vaccinated for it. There is a lot of education to be done with the general public and medical professions to raise awareness of this. Our oldest was fully vaccinated and still got whooping cough. I don’t remember it being as long or as bad as you describe…so maybe his case wasn’t as bad with the vaccination. Pertussis was certainly a hot topic here in Ohio last year as I recall the hospital trying to give me a booster after I had my daughter last August. Hey Katie, thank you for sharing! Honestly, transparency is much more appealing than the dripping with pride “my kids have never been vaccinated or used antibiotics” posts I read from so many bloggers in the natural living niche. Living with humans naturally puts most of us in contact with disease and while it’s everyone’s choice to decide how to treat themselves and their children, I’m always reminded that “pride comes before a fall”. I often remember my pediatrician (father of 4 and doctor for 30+ years) telling me that “you can’t take credit for the good nor guilt for the bad”. If you truly want to research BOTH sides by reading the medical research, check out Dr. Tenpenny at http://drtenpenny.com/home/ or the Vaccine Research Library at http://vaccineresearchlibrary.com/. Both are great resources! Also, Dr. Tenpenny has a great book on the vaccine subject Saying no to Vaccines http://www.amazon.com/Saying-No-Vaccines-Resource-Guide/dp/0979091047/ref=sr_1_1?ie=UTF8&qid=1383244923&sr=8-1&keywords=Saying+No+to+Vaccines. Every parent needs to research for themselves and their family to make the best decision for them!! Don’t let anyone SCARE you into doing something just because they says that it’s so! Thank you for your honest post. I appreciate you sharing your thoughts, feeling and questions on this very touchy topic. I wanted to add my 2-cents. I do choose to vaccinate my children. I delayed it with my first, sobbed over the decision, prayed and researched. What made the choice for me was the idea of “group immunity”. That is that when the majority are immunized, those who don’t or , IMO more importantly CAN’T, get immunized are protected from the disease. I know that for some vaccines, immunity is not 100%, just reduced risk or reduced severity. But vaccines as a whole do reduce and prevent disease. I think this post is timely with the news of a polio outbreak in Syria this week. That scares me so much! My new baby just had her first immunizations this week and I wish that if people choose not to immunize, that I could know about it and so limit contact with my newborns before they are vaccinated. For some diseases, I feel like the choice not to vaccinate is like drinking alcohol- you have to do it responsibly because your choice could affect other people. I know exactly how you feel. I had pertussis, along with my oldest son who was not quite 2 at the time, when I was pregnant with my second baby. It was really scary. And yeah, lots of guilt, doubt, second-guessing yourself. I would cough, cough, cough until I threw up, and ended up on bed rest because the coughing triggered contractions. On the other side, and several years past it, I am now confident in my decision to not vaccinate. It was awful at the time, but because I knew how to manage it naturally, it was not nearly as severe as it could have been. I think a key in not vaccinating is to prepare yourself, both with knowledge and with natural remedies, for these diseases. That way if your family is hit with one you are ready to fight it. Knowing how to fight these diseases takes a lot of the fear out of them. Hi! I’m a mother of an accidental selective/delayed schedule 3.5yr old and a totally no vaccines 18mth old. Neither have had anything serious, though the second gets croup symptoms EVERY time she has a cold. I often forget they aren’t vaccinated fully, but I’m very aware of germy kids and places. I was curious if the vaccinated kids had less severe cases of whooping cough? And did you end up spreading it to anyone else? I appreciate the book recommendations above. I know a lot about why I don’t want to vaccinate, but my doctor was pretty nasty about it (but no insurance for a year, so no reason to see her, thank God), and I have a pediatric NP friend who is very pro-vaccine and I’m pretty sure thinks less of me since I haven’t vaccinated (oddly, she’s totally in the no-fluoride train), so I’d love to have facts I can point to, not just general info. I made this last decision almost purely on gut feeling – this baby is just different, and I feel like the toxic ingredients will be too much of a load on her system. I’ll read more and see. Who knows? It is a complicated issue. It is basically mega dose vitamin C every 20-30 minutes. Anyway, after this was all done I planned to post on EarthClinic.com about our experience because there really just isn’t a whole lot out there. My 4 year old contracted it WC first. It looked like he had a coughing cold, recovered and was trying to expectorate but instead he went into these coughing spasms. When he started having the night time coughing spasms, I figured it was whooping cough and it was confirmed when the whooping began. About 2 weeks later my 2 other kids came down with a cough. I waited about 5 days before going to the Dr. to get an antibiotic but I really wish I would have gone right away, at the first signs of a cough. My 3 youngest have NEVER had an antibiotic, but seeing my youngest loose his breath and vomit each time he coughed was stressful and if I could mitigate the symptoms of the other 2 kids, I was going to try. I did end up giving my youngest an antibiotic because if there was any chance it would help, I was going to do it. It didn’t help my youngest as he was too far into it, BUT the antibiotic did help my 6 and 8 yr. olds, but they did still progress to the coughing spasms, but they are not terribly severe. My 12 year old who was partially vaccinated also contracted it, but on day 2 of a light cough (barely anything), I got her an antibiotic and 3 days later she was completely fine. She was also doing a lot of garlic, which she said helped. So, really if you can catch it early, the antibiotic WILL help! We have also kept up with the Vitamin C. protocol and I think it is most helpful in stage 3. 80% of people who contract WC have been vaccinated, so it really is a vaccine you have to get often. I have to say it is a strange disease in that the kids seem completely normal until the coughing spasm hits. My 4 yr old knows when it is coming and he yells for me so I can hold him and catch the vomit and just be with him when he looses his breath. Then it’s done and he goes and plays until the next one hits an hour or so later. We are now in week 3 of the coughing spasms and seemed to have finally turned a corner where he is only waking up once during the night, but we have been giving him guafenisen this last week to loosen up the mucus, so I don’t know if that is helping. I totally respect those who want to go ahead and get the vaccine as it really is not fun to go through… Is this the worst sickness we have had? I think the whole family having a stomach bug/flu for a week was much worse. As for me, I would still choose not to vaccinate because you have to keep on vaccinating regularly AND it’s still not a guarantee that you won’t get WC. Just me experience and .02. MJ, we did the Vitamin C treatment too. It worked beautifully! As far as antibiotics go, we didn’t do them (except for my stepdaughter, because she went to visit her mom during this time and her mom took her to get them – which was a total waste of time since she had already been sick for weeks). We tried the Vit C recommendation by Dr. Humphries as well. But I found my kids just couldn’t stomach that much Vit c because it was so sour. I also couldn’t think of anything else to mix it in besides juice. My 2 yr old completely refused to take it. So we gave up and just let it run it’s course. Interestingly I got NO negative or comments from anyone, either on or offline. All I got was support. And I wish you had said something because I would have told you about our experience with the vitamin C protocol of Suzanne Humphries – we actually got tested and diagnosed for Pertussis, so I have no doubts as to what it was. however, our cases didn’t last 100 days, more like 6 weeks, and when we all took our Vitamin C faithfully, the coughing was more productive and there was LESS coughing. It was amazing, which really motivated me to spread the word on my blog. I appreciate you sharing your story with us. I know families who have not vaxed at all and have come down with pertussis, and our local health dept. required the children to be in full quarantine for FOUR MONTHS. That’s nothing to shake a stick at. Good thing they were homeschoolers! I went in to get required shots to travel out of the country for a missions trip, and while there, the nurse asked me, “How long have you had your cough?” I told her I came down with it the day before Thanksgiving (I felt miserable and had to skip the family reunion on Thanksgiving that day, or I probably wouldn’t have remembered which day I came down with my cough). She told me that I had whooping cough, a mild case – since I was a vaccinated adult (age 35 at the time), and that in 3 weeks, the cough would completely go away. I was shocked – and horrified – to learn that I had whooping cough! Ugh. She told me that the booster I would get that day would prevent me from ever coming down with whooping cough again…but I’m not so sure. Sure enough, three weeks later to the day that she quoted me, my coughing stopped. I was quite surprised. While my case wasn’t serious enough, I felt, to ever go to the doctor about it (no vomiting and no whooping sounds), I do know people who have almost died from it. A friend’s newborn baby came within a thread of death from contracting whooping cough at 2 weeks of age. A friend’s older boss (in his mid-60’s) came down with it, and he was in ICU for 3-4 weeks, and eventually had to close up his business and retire early, because it ruined his health permanently and changed his personality…maybe due to some brain damage or something? I have no idea. I mention that to say that when people tell me or I read online that it’s no big deal if my kids get whooping cough, I beg to differ. In my case, as a healthy mid-30s gal, it wasn’t serious. In my friend’s baby’s case, it was extremely serious, and in my friend’s boss’s case, it was extremely serious. I don’t think you lost. I think your children and your family had a very hard struggle, and when parents choose to not vaccinate, they really need to consider and be aware of the ravages of some of the diseases that they can get. Yes, some vaccinated people do still get these diseases…but it is usually in a much milder form, although not always. I still would prefer to not vaccinate, because I can see how each further generation is going to have less and less natural immunity, and will eventually need more and more boosters and shots – ick. But I feel that people need to do more research than just decide that they are uncomfortable with their children receiving vaccines. I think parents need to research each individual shot and decide whether or not they are willing to live with the results of their children getting the symptoms and results of individual diseases. Herd Immunity to a virus or bacteria is prevalent within the population. If enough members of the population are not immune to a virus or a bacteria then they are potential victims and vectors for the disease. Second thought, while nothing is 100% safe or guaranteed, the reduction in vaccination rates with a population lowers the strength of it’s herd immunity and raises the risk of widespread illness, injury and death. Every time you make a decision, you are making that decision as part of the population. As an individual you may think that “this is my body/family/home.” But no one is an island. We are all connected. Consider the connections in your decision. And remember that nothing is certain. Only probable. Also wanted to add for Katie: glad to hear that you’re all doing better. Having sick kids is a very difficult experience. Not everything “natural” is good for you, and not everything “man made” is bad for you. Good luck figuring out which is which. I’m not getting into the vaccination debate because I honestly don’t know where I stand with 100% certainty. The one thing I do know is that life does not exist without RISK. Sometimes I feel like in the world of crunchy bloggers we talk that if we make sure to do a, b, and c and never let our kids consume HFCS, be vaccinated or eat artificial colors and flavors risk of sickness and death will be eliminated. That’s simply not true. We live in a fallen world. Sickness and death are an inevitable part of it. The temptation to idolize certain actions (or certain restrictions) does nothing but provide an idol in our lives. You do the best you can, and leave the rest to God. Don’t beat yourself up over the choice, because ultimately, God is in control, NOT us, despite how much, as parents, we want to be. Nothing to be ashamed at for having whopping cough. More shaming to fill kids with vaccines, before they are ready. My oldest had nine vaccines in one day, went into seizure and nearly died. All along the way doctors saying it wasn’t the vaccines. I’m more concerned with how sick your kids have been? You might want to look into food allergies? Milk would be the biggest one. Although soy likes to mimic dairy. We are allergy free here, and the most my kids have ever had is a common cold. There are also natural ways to build an immune system. Although it’s good to get sick from time to time. But pneumonia that often, worries me? Something for you to google and research to find out if it’s right for your family. We are allergy free, gmo free, I’m careful about our meats, I have a BIG garden and grow nearly everything ourselves. So I know where our food comes from. Scary world out there. Not to sound negative, but from my experience and that of others I’ve known, once one gets a case of pneumonia, they tend to be more susceptible to it in the future. If your doctor told you otherwise, praise God! That is great! I personally and have known a number of others that when we’ve had the discussion about pneumonia have had the same experience of being vulnerable to repeated instances. Effectively, one has to balance the risks of contracting the disease, the risks of the disease itself against the risks of the vaccine. All we can do is the best we can do at the time based on the best information we have available. The rest is up to God and the lessons He allows us to learn. Oh Tammy, I can only imagine your grief after losing your baby, and I’m so sorry. Your husband is a wonderful man, and your faith in God too, what rocks you have to cling to. Our doctors don’t say much, apparently – we read online that pneumonia tends to make more pneumonia more likely within 3 months, but then not after that. ?? Go figure! I wonder if I should be doing things to support John’s lungs/respiratory health in general after both these experiences. Both of his pneumonia incidents were super mild really, just like a bad cold with a day of fever, so we definitely are grateful for that! Thank you so much for sharing your stories; what another good perspective to have…I wish doctors were more open about risks – they should be telling all women of childbearing age about the increased risk to unborn babies, for Heaven’s sake!! I hope you’re not feeling too guilty. My sister and I were fully vaxed as children and I got whooping cough (dr told my mom most likely FROM the vax) when I was 3 months old and my older fully vaxed sister who was 3, got it from me. I’m so glad your kids are ok! I amm 55, had my oldest at home in 1976. The other three were born in hospital or clinic (I live in Alaska) and required varying levels of intervention, the youngest an emergency C section. I studied all that was available on alternative choices with each one (which wasn’t much back then )(youngest born 1986) and we chose vaccines. There were not as many back then, either. That is what I stand on-my children, my choice. I know the risks for choice affect not only our own family but all those in our personal worlds. The consequences of free will, both our own and that of every other human, can be far-reaching whether we intend them to be or not. The world has become a very dangerous place and that is just a fact. If you are a Believer- PRAY. If not, be as wise as you can be, seek information from a variety of sources, not just the ones on a single side of an issue. I now have 13 grandkids with 2 more on the way as well as the first great grand due in April. The parent’s choices are across the spectrum fom very conservative to very liberal and back again. Holidays at our house can be quite, umm, stimulating. And loud. Pertussis is no joke, neither is polio, measles, mumps, or hepatitus. But we CANNOT protect our families from everything, no matter how hard we try and we just need to grasp and accept that. I could tell you such stories of both success and failure! For me, I trust God to never leave or abandon us and then do my best, day by day. Sorry I went on so long, Got rolling and could not stop. If any of you want to talk to an old broad who has been thru the process and survived, feel free to email ([email protected]) or facebook (Mona Casselman). I am a lifelong nonconformist, alternative Christian, hippie herbalist gardener with a fiber obsession and a retired cop husband. God bless you kids as you make your choices and lead your lives! Beautiful, Mona, thank you – you hit the n ail on the head about free will and not being able to protect from everything! You are a pioneer woman to our kind!! :). Thank you for paving the way. Love your attitude on life. Please don’t feel guilty! When I was growing up, my entire family was fully vaccinated and my mum and brother still contracted whopping cough. My mum was soooo sick, it took her years to really get over it. Now we have 2 young children and 1 on the way, and do NOT plan on ever vaccinating them!! Good Job Mama..this is another great story on how strong our bodies are to heal themselves. If given the right tools such as good nutrition, rest, happy lifestyle etc..our bodies are built to heal themselves! Kids will get sick…and its a ton of work to get then better but in the end..their bodies become stronger! And as they age illness will be handled faster and easier. Would love to feature you on our website! You are very brave for sharing your family’a story, and I have no doubt others will benefit from your honesty and disclosure. I’m so glad the kids are on the mend. No one wants to see their kids vulnerable and ill, no matter their opinion on vaccinations. Blessings to you. I do think you are very brave to share this story. When my babies were born, I was absolutely afraid of vaccinations. My cousin developed Autism shortly after receiving her MMR’s at 18 months back in the 90’s when thermosil, questionable preservatives, was being used. That being said, my pediatrician was originally from a third world country and cautioned me about the risks of not getting the vaccine. I was never pressured, but he told me the stories of patients he had treated in those areas (one of which was whooping cough in an infant). He brought about a fresh perspective for me of a world without preventative vaccines and the children who die because of it. That was enough to scare me as well and get me seriously thinking about vaccines. So with my pediatrician on my side, we took vaccines very, very slowly. We completed all of the well tested vaccinnes, but on a much slower pace than recommended. I would also not let them get more than one vaccine at a time. I mean really, we want to give 7 vaccines at once? Is that really safe? Will you really know which one the child has a reaction to if they have a reaction? I was at the doctor’s office a lot. My kids did not get their MMR’s until well after they were two once the brain barrier was in place. DPT’s were broken down and given singularly. I think the important thing to remember is that we do the best we can as parents with the information that we have. I do think vaccines are important. They have saved countless lives and continue to do so. But they have caused harm too. Autism, etc. I don’t agree with the accelerated rate that we give the vaccines nowadays, but I think it’s like everything…there is a time and a place. Thank you for sharing!! I wish I had a ped who was willing to walk slowly with me and guide me, and even help find single vaccines…. We live in Asia, and that heavily influenced our decision to vaccinate our children. I did lots of research, as well, because it was a decision we didn’t take lightly. Most people in the US have never seen the ravages that these diseases can cause, especially in places where medical care is not as advanced. The choice of whether or not to vaccinate is definitely a “first-world” dilemma, and as such, I think it is important for those in the “first-world” to carefully research and consider. At the same time, it doesn’t hurt to remember that many, many lives around the world have been saved because of vaccines. And that many, many lives are lost because of lack off access to both vaccines and proper medical care. I agree with so many of the comments already posted here, and also want to thank you for sharing. The only thing I keep wondering about is why is Pertussis getting harder and harder to vaccinate against (requiring more boosters, etc.)? Are we creating “super-bugs” because of our vaccinating? Finally, I just want to say, any decision a parent makes should not be out of fear. Unfortunately we live in a society that promotes its agendas and seeks to achieve its goals through fear-mongering campaigns. I applaud every parent who makes informed choices and stands by them, rather than give into the fear that’s been placed on them. Kudos, Katie, for making an informed decision and standing by it out of faith in an all powerful God! There’s not a lot more to say about the vaccine debate than has already been said in the comments before mine. *SCIENCE has not proven that vaccination actually accomplishes the intended immunity. *FACTS have shown that ‘successful’ new vaccines are often introduced at the time when the targeted illness is on its way out, the survivors having acquired immunity from exposure/recovery. The vaccine was never responsible for ‘conquering’ the illness, and the ongoing immunity in the population was/is because the exposure/resultant immunity passed down to future generations. *Outbreaks of communicable illnesses are worst in vaccinated populations (statistics are available to show this, I just don’t have the link to share; I have seen the statistics and graphs, though). *Vaccinated individuals are often walking timebombs for spreading the illnesses. They shed the microbes after they are vaccinated, most especially if it is a viral illness. This means, in particular, that your children could very likely have been exposed to a child recently vaccinated and that THIS is why they caught whooping cough! *Vaccination causes exposure to disease-causing microbes in a manner that bypasses our inherent immune defenses, traumatizes our immune system (in several ways including the toxins in vaccines), and renders the vaccinated person more susceptible to a wide variety of illness in addition to the one(s) vaccinated for and does so far into the future. None of this makes having to cope with a whole family ill at once with the same thing any easier. None of this answers the anquish of those who have lost loved-ones because they had damaged immune systems and didn’t survive an illness or were damaged from it everafter. There is significant risk, no matter how you choose. Because we cannot trust the sources of our medical information to be utterly truthful in what we laypeople and the medical professionals are taught, the debate will continue. Thanks to you, Katie, for sharing your experience and your fears and doubts. And thanks to those who commented about effective therapy for WC. Whooping cough is from a bacteria. The vaccine is non cellular. It is a protein. This doesn’t just spontaneously turn into the pathogen. Ever. Has no scientific basis and makes no sense if you have basic knowledge of microbiology. Here is a few ideas using essential oils for whooping cough. Tara – My 2 yr old daughter and I both just recovered from whooping cough using only essential oils and natural products. It is known as the 100-day cough and we are almost completely done coughing after only 6 weeks, compared with the 3-4 months I was told to expect. I am not a doctor, so remember this is just my experience. Please know that my daughter has used oils since the day she was born, and all through my pregnancy, so I do not really dilute as much as other people may recommend. I think you really have to use the oils based on your own children and exposure. For my daughter I would layer Thyme, Cypress and Eucalyptus on her chest with FCO and apply a warm compress until it was cool. We did this every hour she was awake. On the half hour between the compress I would alternate every other time applying OnGuard or Oregano with FCO to her feet. I only used the Oregano for the initial 5 days of the cough, then I would use only OnGuard for 10 days before resuming alternating for another 5 days. At this time I would also give her 3-4 droppers of colloidal silver. We diffused Lemongrass or Breathe all day and all night throughout our house. I also gave her a probiotic daily. I used DigestZen when her stomach was upset and also at night because her coughing would sometimes be so severe that she would vomit at the end, this seemed to help reduce that. The only way I varied this for myself as an adult was to take the Oregano in a capsule. Whooping Cough has been in the news a lot lately. There have been outbreaks, and in some cases people panicking about this illness that’s supposed to be prevented by vaccines. About 60% of confirmed pertussis cases have been in people who were vaccinated for it. The virus that causes the illness has apparently mutated enough that the vaccine is not preventing it anymore. For this reason I want to share a resource with you. It’s a good idea to understand the illness, what it looks and sounds like, and what you can do about it, in case you or someone you know gets it. Here is a website devoted to whooping cough where you can learn about it and listen to sound files of confirmed cases. I think this site is helpful in providing information for an informal diagnosis, but what it lacks is treatment options. After reading the symptoms and listening to the sound files on that page, I strongly suspect my toddler suffered from whooping cough this winter. I treated him at home, but when he was very sick and I felt I needed reassurance, I took him to the doctor. His lungs sounded clear (as I now know is common with whooping cough) and he was diagnosed with a viral infection. He’s doing much better now. The cough is gone, so there’s no point in trying to take him back in for a diagnosis. However, I’d like to share what I did to treat him at home during his illness. These are treatments I use for basically any respiratory illness, including croup, which I’ve had a lot of experience with as a mom. Essential oils: Peppermint to reduce congestion. Eucalyptus for cough. I have a blend made by doTERRA that has both of those oils as well as others that help with respiratory problems, called Breathe. I applied Breathe to his chest and bottoms of his feet often, especially at night to help him sleep without coughing fits waking him up. I also applied Marjoram and Thyme oils to his chest and bottoms of his feet. They’re known to help with respiratory illnesses as well, and specifically recommended for croup (I thought he had croup at the time, although it wasn’t presenting as typical croup, so I questioned that after the first day or so but continued with the oils anyway because I knew they wouldn’t hurt and I noticed he breathed easier and coughed less when I used them). I also applied Oregano essential oil to the bottoms of his feet at least twice a day to help kill the virus. When he had a fever for several days I used Peppermint oil to help bring it down if it was high enough to make him miserable. For the most part I left his fever alone because I knew it was helping to fight the illness. Steam and Moisture: When his coughing and breathing got really bad I took my son into the bathroom and sat next to the tub with him as I ran a HOT bath. Many times I put the essential oils (Breathe, Marjoram, Thyme) into the water to help release them into the steam as it filled the bathroom. I also gave him a bath once a day with the oils in it as well, making sure to keep the bathroom door shut and keep him in as long as possible to breathe in the steam. I also ran a vaporizer or humidifier in each bedroom and occasionally added a drop of Breathe to the water in them. I also gave him a nebulizer treatment one night, but with no medicine. I put colloidal silver in the nebulizer, and it seemed to calm his cough. Homeopathic Medicine: I gave him Aconitum Napellus and Kali Muriaticum to help fight the viral infection. I also used Chamomilla to help keep him calm when he didn’t feel well. Mother’s Intuition and Prayer: This was really important for me. I used my past experience and knowledge to help me know what I could do for him, and I constantly prayed. I prayed that if there was a need to seek medical attention I would feel an urgency to do so. I never did feel that urgency, even when he coughed so hard it made him vomit, or when I had to take him into the bathroom and help him breathe with the oils and the steam. I had moments of doubt, but for the most part I knew that he would be alright and that I could safely continue treating him at home. Here is one more post on whooping cough helps. Whooping cough is a bacterial infection of the upper respiratory tract, primarily effecting both vaccinated and unvaccinated children. It’s highly contagious, and adult whooping cough is not uncommon. It starts as a common cold and develops into a spasmodic, persistent, suffocative cough accompanied by a sore throat, fever, mucus secretion and vomiting. Coughing continues until the lungs are emptied of air and the sudden, hard intake of breath causes the characteristic whooping sound. Coughing attacks are fierce and can occur up to 40 times daily, lasting for two months or longer. My older son has whooping cough right now, or para-pertussis (the other strain of pertussis not covered in the vaccine). We were up all night last night. There is an outbreak in my area and I have heard kids everywhere coughing with the typical cough. Interesting that whooping cough outbreaks are HIGHER among vaccinated children compared with unvaccinated children.Here is a list of the remedies I am using, along with my dietary suggestions. The number one homeopathic remedy indicated for whooping cough. There are some great natural cough syrups that you can purchase at your local health food store. These help ease the child and parent. Check them out and try a few. -drink homemade chicken stock, water, fruits, vegetables, rice. Lots of rest and comfort. That is a big part of the healing process. Here is another helpful post on Stubborn Coughs. I thought that my youngest had whooping cough and while trying to search online I saw in multiple that 80% of cases where through vaccinated children. You don’t know that they would not have gotten it had they had the vaccine. After reading your post, I have a couple questions. 1) How did you go about on telling your pediatrician that not vaccinating was the route that you wanted to take with your middle child, since you had fully vaccinated the oldest? * Recently, I had to switch pediatricians due to a job relocation. The doctor that everyone suggested in going turned out to be so pro-vaccination that after listening to my concerns about continuing vaccination for my youngest daughter, he immediately stated that we need to look into the flu vaccination. My mouth dropped and I have never been bad since. 2) If you had to switch, how did you find the doctor that you felt comfortable with and felt that he was just as concerned as you are with vaccinations? * I moved to a small town (32,000), but it doesn’t seem that parents that are like-minded as me are common in this area, so it has been impossible to find the right doctor for us. 3) Do you feel that you have received a cold shoulder on this decision with members of your family or friends? Thank you for taking the time to read this and reply. Sometimes I feel that I’m alone in this decision and that since I have vaccinated one until he turned 2 and the other I’ve tried to refuse or prolong the vaccination, and I’ve been met with a strong hand of it’s what is best for your child, but I’m not so sure it is. Thanks again! Sweet, sweet, Mama….thank you for opening your home to those of us on the outside. You have opened yourself up to so many opinions…kind ones and hateful ones….My only advise to you is…DON’T READ ANY OF THE COMMENTS!! Your decisions are your decisions and your heart to share your story doesn’t give anyone the right to walk or speak in judgement of you. Peace be with you, Sister. found this through a facebook share – I avoid crunchy blogs and those who believe they are so much better than the rest of us – but in this case I have to say this: you spend a lot of time on how hard this will be for the rest of your crunchy buddies if their children contract whooping cough and how difficult it was for YOU. I’m sorry for your ruined carpeting, but no matter how unfortunate that was for you, how do you suppose your son felt vomiting several times a day? I’m sure it was tough to have to wash the sheets each day from your oldest bed wetting, but imagine how he felt to deal with such an embarrassing thing? Sorry your children kept you from the library and you got dirty looks, but really, who suffered here – you or them? And what of the potential infants you could have infected and changed the course of their lives? They and their families didn’t sign up for your self-righteous crunchy club. You thought you were smarter than science and you’re not. Your comment is rude, but I will still approve it because I believe in conversation. Another post that I will write is about the horrible feeling of possibly infecting infants or the elderly. Do you really think I don’t care about how my kids felt? Do you think all this, this whole story, the time we spend researching, praying about, wondering about vaccines has nothing to do with what is absolutely best for my children? I think it’s pretty clear that my kids suffered, but thank you very much for pointing it out. If sharing a story and encouraging others to really think about all the consequences of their actions is self-righteous, then I guess I need some new vocabulary training. I don’t have a clue what the right choice is when it comes to vaccines, but I do know that science doesn’t know everything yet. If this post sounded like I thought I was very smart about anything, then I made a mistake in how I shared the story. The truth is, I don’t know who to believe – science which is ever-changing, with facts on all sides? It’s not easy being a parent, and there will always, always be times when children suffer. People will get sick. People will die. We can’t prevent everything bad from happening…but as a Catholic, I rejoice in the fact that God redeemed suffering when He allowed Jesus to suffer on the Cross. If my kids had to suffer from whooping cough, then I pray that I taught them to suffer well, to suffer valiantly, to offer their sufferings as a prayer. I pray that I can use that suffering to help someone bring clarity to a situation. From what I’ve read, the reason the Pertussis shots are recommended so frequently nowadays is that they don’t work. The pharmaceutical companies know this. If they did work, those people already vaccinated would have immunity and not contract it. My children are vaccinated as I did not know about all the contents of the vaccines and indications for them when they were throwing them at them at the time. No paperwork was given to show the risks for contracting the disease / effects of the diseases / contents of the vaccine / testing to show the effectiveness of the vaccine. All they did was give me a paper to sign with the possible side effects of each inoculation. As hard as this was and as much as you second guessed yourself, Katie, you made the best choice you could and now your children will be immune for life. Blessings to you and your family and may you enjoy some deep rest soon. I wasn’t sure after reading this, if you had decided that it was a good or bad thing that you didn’t vax. I can tell you our experience with it. We have 7 children, the oldest 3 were fully vaccinated thru elementary school, my middle one received them thru 18 mths, the next 2 have never had any, and the last one has had only the respiratory vaccines. The last one has DS and had a tracheostomy at 6 weeks old, and we felt the risk with the trach at his age was significant enough to warrant a “rather be safer than sorrier” approach. I think we were right on that call. When he was 6 mths old, our family was exposed to pertussis, and 3 of us contracted it. Don’t know where we got it, but we got it. Now, my husband hasn’t had a booster since he was a young child did not get it, my middle daughter who had vax til 18 mths did not get it, and my 6 mth old trach baby did not get it. The oldest 3 were already moved out, so they weren’t exposed. I, who was a Navy brat and moved around the world, and had boosters up until I was an adult, DID get it, and my younger 2 who had No vax got it. The thing that bothered me the most about it, was that after dealing with the CDC, they had few answers as to why certain members got it and certain ones didn’t. If the vaccine needs a booster every 10 years like they said, my husband AND my middle child should have also gotten it. And, I had had more of the vax than anyone, but I got it. The other thing they couldn’t tell me, was if those of us who had contracted it, were now immune naturally. Never got an answer to who would be likely to get it in the future, if exposed. Would we be immune forever? Now that we’d had it? Would my husband never get it because he seemed pretty immune, along with my daughter? They seemed to have few answers on that, and so, I feel like we didn’t play the game and lose, I kind of feel like we won, I believe that we ARE now more naturally immune to it, because our bodies have dealt with it. I also believe it is entirely up to parents to make those decisions, because no one is walking your walk, and no one should be able to tell you as a parent, what to put in your little child’s body.